Movie Review - 'Side Effects': Stylish Medical Thriller Is Clinically Silly Steven Soderbergh has said Side Effects will be his final film. But the talented director has turned in a stylish but silly thriller — a sad closing chapter for a notable career. It's the drug's fault, man. That's the defense offered by the perpetrator brought to trial in Side Effects, a stylish, vaguely Hitchcockian dud. But what excuse does this fatally silly movie have? The film, reportedly the final big-screen effort for prolific director Steven Soderbergh, begins in a New York apartment where something bad has happened. Blood on the floor, smeared and tracked by footprints, suggests murder, suicide or extreme clumsiness. It's not the last option, of course. But then the story hits rewind, postponing the moment when we learn who was hurt, and how. Three months earlier, Emily (Rooney Mara) is waiting for her husband's release from prison. Martin (Channing Tatum) isn't the violent type; he went away for insider trading. Yes, the beefy actor who usually plays dancers, thugs or thuggish dancers is now impersonating a Wall Street broker. It's dubious casting, but not nearly so implausible as the script. Emily played the role of loyal wife while Martin was in the pen, but she seems to crack once he's free. An apparent suicide attempt puts her under the care of Jonathan Banks (Jude Law), the psychiatrist on duty when Emily is transported to a Manhattan hospital. Her case is perplexing, and Jonathan soon consults Emily's previous shrink, Victoria Siebert (Catherine Zeta-Jones). Suspiciously prim in pulled-back hair and thick-framed glasses, Victoria gently guides Jonathan to prescribe a new antipsychotic drug for Emily. He's amenable and already has a cozy consulting gig with one pharmaceutical company. Then something terrible happens and dispensing that pill no longer seems to have been a good idea. In fact, Jonathan's hasty decision may doom both his career and his marriage. But the British-accented, French-speaking, fashionably unshaven doc decides to fight. At which point, it becomes clear that it's Jonathan — not Emily and definitely not Martin — who's the protagonist of this saga. Law's likability serves him well for much of the movie, keeping the audience on his side as many of the characters turn against him. But as Jonathan's defense of his reputation turns into an unethical offense, viewers may seek another character to admire. That search will be difficult. 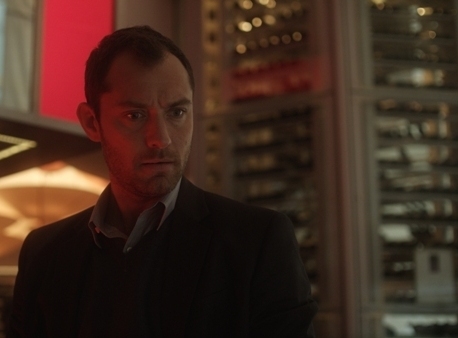 Though his Dr. Jonathan Banks doesn't receive top billing, Jude Law will prove to be the key protagonist of Side Effects. A note about spoilers: Movie critics aren't supposed to reveal narrative surprises, so as to protect filmgoers from knowing too much. But suppressing the plot of this clunker protects only its makers, notably scripter Scott Z. Burns, who previously wrote Soderbergh's Contagion and The Informant! Nonetheless, this review will not disclose who does what, or why. It won't say if drug-peddling corporations are fingered as villainous or at least sloppy. It won't even note that the movie has an archaically smirky attitude toward — nope, can't use that word. OK, how about this: Side Effects will not be winning any awards from gay-rights groups. Soderbergh, who used to make a point of shifting methods from film to film, has lately settled into a — to put it nicely — groove. Like Haywire and Magic Mike before it, Side Effects is an elegantly composed, neatly edited handling of a screenplay that doesn't merit such directorial finesse. The movie maintains its sense of style throughout, but that hardly matters as the story just gets stupider and stupider.